Consuming food involves more than just taste. It is a full sensorial experience. The visual appearance is one of the most powerful ways to capture a consumer’s attention and interest. The colour of food and beverages is a prelude to nutrition and good taste. Over the past decade, manufacturers have started to switch from synthetic dyes such as FD&C’s to natural alternatives. Natural dyes have in fact been used for centuries to colour food, beverages, textiles, medicine etc. The natural colour market continues to grow at 10-12% per annum as consumer product manufacturing companies see the benefits of ingredient transparency. According to a survey conducted by Mintel, 20% of US consumers would like to see more “free-from” artificial colour (Mintel Food & Drink: Ingredient Report September, 2016). This paradigm shift in buying behaviour is a result of core consumers wanting cleaner, more natural and “friendly” labels. In most finished applications, technical challenges always exist when using natural colours. These challenges can include cost, processing conditions, interaction with other ingredients, heat, light, pH and oxygen. Specifically for dairy applications, similar challenges exist. Most dairy products are typically stored refrigerated or frozen. Therefore light exposure may not be a factor depending on packaging and shelf life of the finished product. However, other factors such as pH and temperature could be problematic for a product developer. For example, in yogurt, one must be concerned with pH differences between fruit prep and white mass. For some colours, specifically those that are fruit and vegetable based, a hue shift might occur causing the colour to move from red to purple (bluer) over time. For other colours, this may not be an issue. In addition to pH, exposure to heat could also impact the performance of a natural colour. For example, certain colours such as beet juice concentrate might turn brown when applied to dairy-based beverages that are thermally processed (pasteurization). Time and temperature can significantly impact results. Other colours such as carmine and paprika will be minimally impacted. Ice cream for example, has a pH of about 6.5, is not exposed to light, and does not undergo heat or pH changes. This makes it an ideal application for the use of red beet as a strawberry colour. While natural colours for dairy applications do come with challenges (no different than other food products) Kancor and Mane worked to find the right solution. The C-CAPTURE line of products offers various natural colour options to suit various dairy applications. Based on the results of stability studies Kancor and Mane has been able to uncover a variety of solutions to naturally colour dairy-based products. 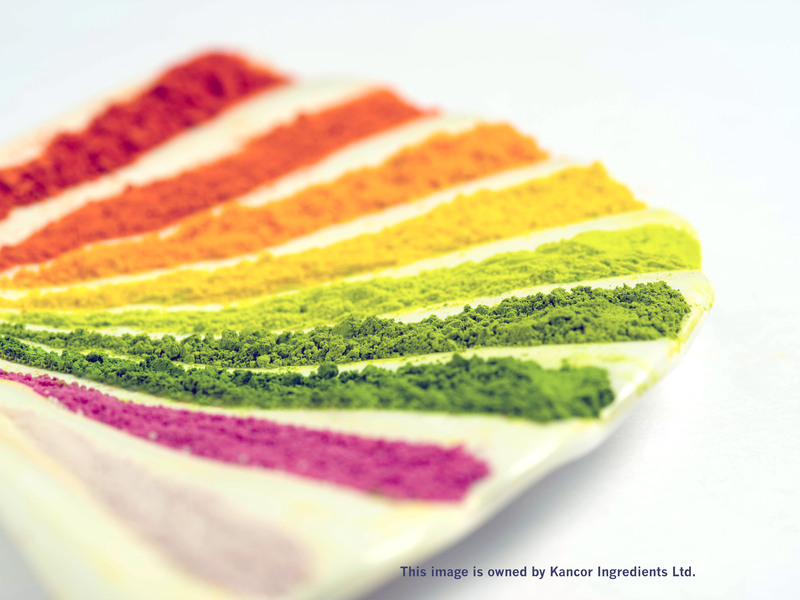 Kancor offers a wide range of natural colours for various product platforms and systems. 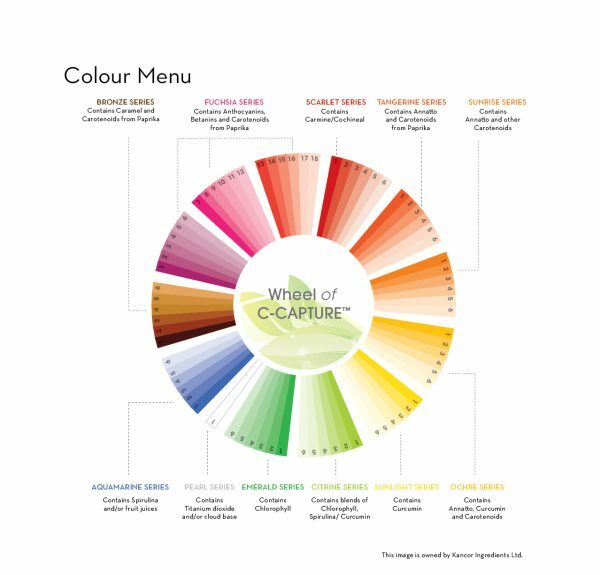 C-CAPTURE includes colours such as turmeric (yellow), a host of carotenoids including annatto, paprika and beta-carotene (yellow, orange and reddish orange), beet juice concentrate (pink), fruit and vegetable juices (red to purple) to name a few. In addition, the company offers spirulina (blue), several sodium copper chlorophyllin (green) options, caramel and other customized blends depending on, application, market location and desired hue. Kancor is a significant player in the extraction of natural raw materials. The company has been extracting and manufacturing natural coluors since long. In the 12th Global Dairy Congress recently held at Warsaw, Poland. Annual Word Dairy Innovation Awards, in association with FoodBev media was announced. Accelerated stability study of Ochre and Sunlight series of C-CAPTURE in application media yogurt got selected as Finalists for the categories- Best Dairy Ingredient and Best Dairy product from Asia.